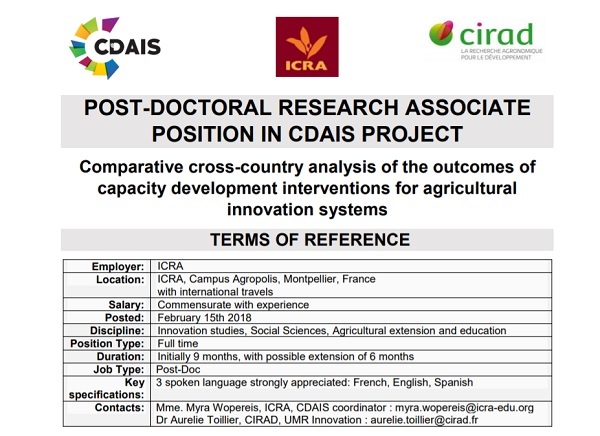 Post-doctoral Research Associate position is available at ICRA, in collaboration with CIRAD, UMR Innovation. The candidate will join CDAIS (Capacity Development for Agricultural Innovation Systems*; 2015-2019) project whose goal is to experiment new approaches for the identification and support of capacity development of agricultural innovation systems (AIS) stakeholders in developing countries. Project assumption is that many countries are not fully exploiting their innovation potential. The capacity of individuals and organizations must be strengthened to create an enabling environment and, crucially, reinforce or make more effective Agricultural Innovation Systems (AIS). A “common framework” on Capacity Development (CD) for AIS was developed and is being tested in eight pilot countries (Angola, Rwanda, Burkina-Faso, Ethiopia, Laos, Bangladesh, Honduras, Guatemala). The ultimate goal is to promote innovations to contribute to the sustainable productivity in agriculture. To capture the changes and impact achieved by CDAIS the project, a monitoring and evaluation for learning (MEL) system was developed. It is derived from the concept that continuous evaluation and learning enables adaptive management of innovation projects hence, improve their performance at the niche and system levels. Monitoring is used as an evidence-based approach focused on knowledge, attitude and practice (K-AP) changes within boundary partners of the CDAIS project. In particular, the MEL system is seeking the ‘difference’ that CDAIS project is making. Please take a closer look at the Post-doctoral Research Associate position description in the attached document. * CDAIS project is funded by the European Commission (EC) and jointly implemented by the European Alliance on Agricultural Knowledge for Development (Agrinatura) and the Food and Agriculture Organization of the United Nations (FAO).